If these delectable tacos look vaguely familiar, they should. They're modeled after the famously fantastic Crunchy Blue Corn Chickpea Tacos (aside from a few obvious changes). Since I'm in love with everything potato-related, I figured there was no harm in marrying a few red spuds with some taco seasoning and a shell or two. 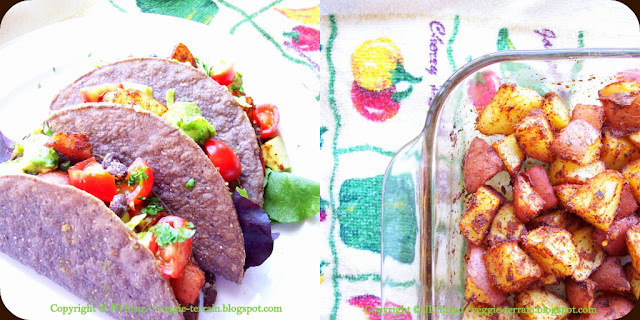 Turns out, I was right - these tacos are simple, satisfying, and oh-so-scrumptious. 1.) Pre-heat oven to 425 degrees F. 2.) Cook potatoes in boiling water for 10 - 15 mins., until tender, but not mushy. 3.) Drain potatoes & pour into greased cooking dish. 4.) Gently toss potatoes with olive oil & taco seasoning, stirring to combine. 5.) Bake, uncovered, for 20 mins. 6.) While potatoes are cooking, heat black beans in small pot on stove, stirring until warmed through. 7.) When potatoes are done, remove from oven & assemble tacos. 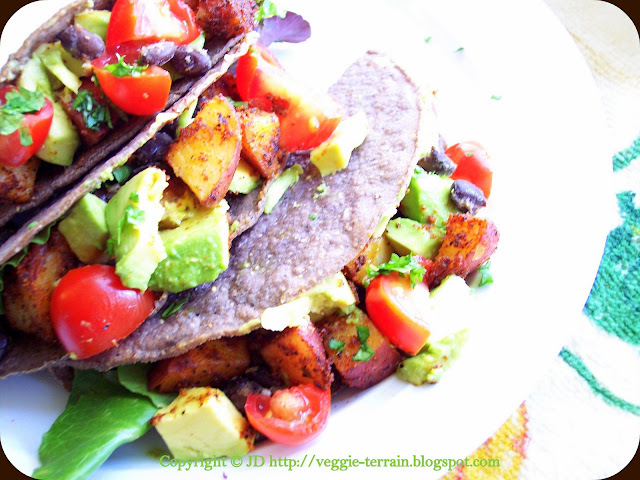 Place lettuce in each taco shell, then add potatoes & a few beans. Next, add tomato & avocado. Finally, sprinkle each taco with cilantro before serving. These look DELICIOUS! I love all of the colors! Whoa tummy is rumbling....well it's abt time ya started posting more Funky JD! Good eats...*cue alton brown's theme. Thanks for your comments abt my husband. I am very proud of him. we had tacos last night! we had pinto and garbanzo beans sauteed with some cumin, chili powder, lime juice, and cilantro in corn tortillas with vegan sour cream and taco sauce. YUM! yours look delicious! I LOVED you chickpea tacos so much that I absolutely have to try these next. I am sure this is definitely going to be one of my regular menu items! 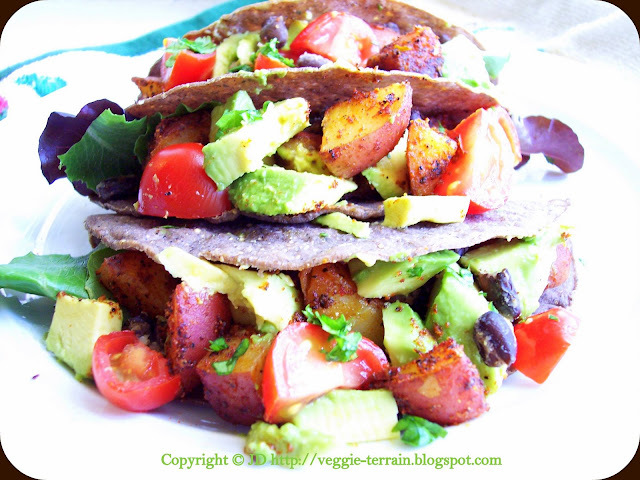 I wouldn't think potatoes would work well in a taco but they look delicious. Definitely trying these sometimes soon! Those look like perfection, yum! I love these colorful tacos! I actually have a taco dinner planned, but I think mine will be chickpeas this time. But I can see potato tacos in my future too! Yum, I want some! I really need to start making tacos for mealtime -- it looks like fun! And yours really are so pretty and colorful. These tacos are such a feast for the eyes, but I'm sure even more of a feast for the stomach! Looks amazing! you're killing me w/ all the great food. I am so hungry and I just keep reading post after post of deliciousness! potato in a taco is genius! I'm going to have to try these out too! (And the chickpea ones) Mmm you create good tacos!! Can't wait to try the taco seasoning on beans. Serious inspriation here! I am so making these as lettuce wraps.